Good tidings we bring to you and your friends! 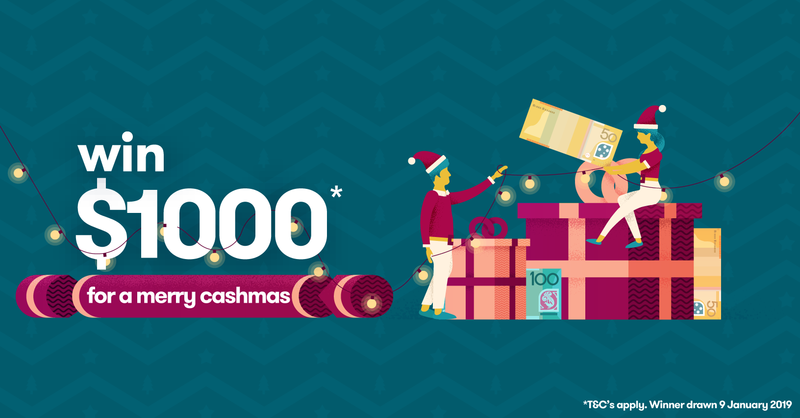 We’re gifting a chance for a Merry CASHmas. Thanks for your interest, this competition is now closed. Congratulations to Louise Williamson (Victoria)! This Promotion Schedule is incorporated into and forms part of Canstar’s “General Terms and Conditions of Promotions”, available at http://www.canstar.com.au/terms-of-use/. The General Terms and Conditions apply to the Promotion subject of this Promotion Schedule. To the extent of any conflict between this Promotion Schedule and the General Terms and Conditions, this Promotion Schedule will prevail. 1 Promotion Period This Promotion commences at 5:00pm AEST on Monday 26th of November, 2018 and closes at 11:59pm AEST on Monday 24th of December 2018. (b) Subscribing to one or more of the Canstar e-newsletters of your choice. 4 Details of Prize and value The draw will be in relation to one (1) AUD $1,000.00 cash prize (called a “Prize”). The Prize will be transferred to the winner’s validly nominated Australian bank account upon confirmation of conditions. 5 Draw date, time and location The Prize winner will be randomly selected from a list of eligible entrants. The draw will take place during business hours on Wednesday the 9th of January 2019 at Level 21, 143 Turbot Street, Brisbane, QLD, 4000. The Prize Winner will be notified by email no later than 5pm on Wednesday 9th of January, 2019. 6 Permit details This Promotion is authorized in NSW by Permit number LTPS/18/29748. The conditions of the permit(s) will override these conditions to the extent of any inconsistency.